This past week, David and Wu Han traveled to Chicago, IL for the 80th birthday celebration for noted arts philanthropist and enthusiast, Joan Harris. They took part in a special gala performance with several other noted artists with close connections to Joan Harris. There are very few people who have done as much for the arts in the United States as Joan Harris. This past week, we had the wonderful opportunity to be in Chicago celebrating Joan’s 80th birthday. An array of artists including Wu Han and myself were on hand to mark the occasion including the Emerson String Quartet, Renée Fleming, Pinchas Zukerman, the Escher String Quartet, the Hubbard Street Dance, and musicians from the Chicago Symphony Orchestra. The program was diverse and beautifully planned by Harris Theater manager Michael Tiknis. 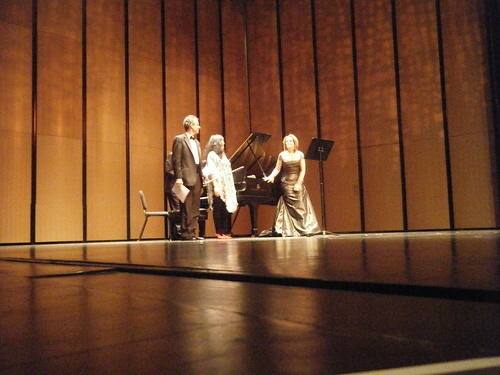 It included a movement from the Schumann Piano Quintet with Wu Han and the Emerson, Rachmaninov songs with Renée Fleming accompanied by Wu Han and Eugene Drucker on obbligato violin, and four of Mahler’s “Rueckert” lieder in an exquisite arrangement for piano quartet and voice by the Swiss pianist Christian Favre. Joan had specially requested the slow movement of the Rachmaninov Cello Sonata, which we were delighted to provide. The gala event was held at the Harris Theater in Chicago’s beautiful Millennium Park–David Axelrod and Bill Kurtis were the masters of ceremony. It was a remarkable event for a remarkable woman. Wu Han takes a bow with Renée Fleming and violinist Eugene Drucker. At the conclusion of the concert, the entire audience rose and turned to Joan to pay tribute. It was both fitting and moving. The event was also a wonderful opportunity to share the stage with the stellar young Escher Quartet, which was brought to the event by Pinchas Zukerman for a collaboration in Mozart’s g minor quintet. 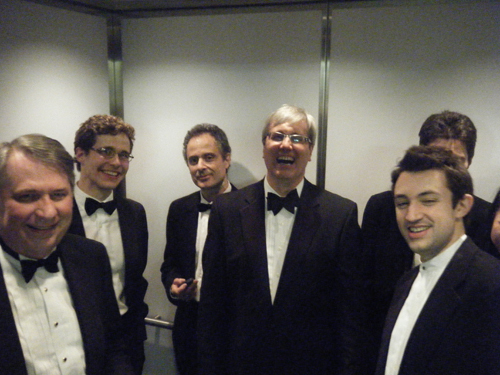 At one point after the concert, both Emerson and Escher shared an elevator. Our relationship with Joan stems primarily from our participation for many years at the Aspen Music Festival and School. 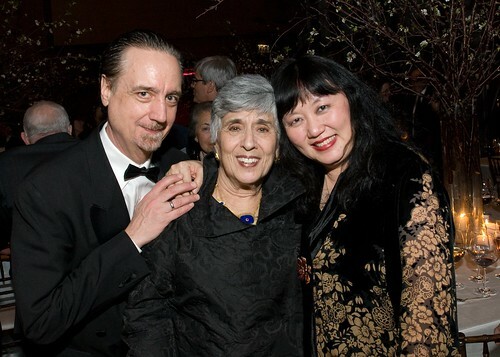 As the former chairwoman of the Aspen Music Festival, Joan constantly recognized quality and was extremely supportive of the Emerson String Quartet, Wu Han and myself. I distinctly remember Joan and her late husband Irving attending several recording sessions of the Beethoven Sonatas for Cello and Piano at Harris Hall in Aspen. Her constant presence and support have been an inspiration to countless artists throughout the years. This remarkable event was a fitting testament to all Joan has accomplished through her involvement in the arts, education and the humanities. Joan Harris and the Emerson String Quartet. 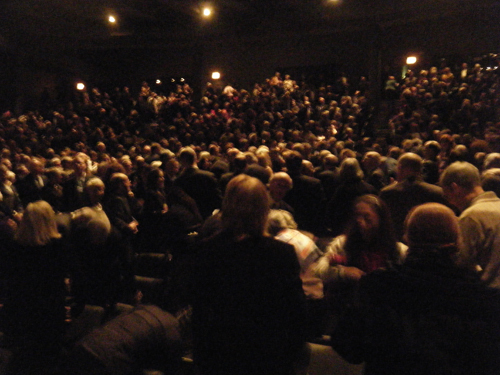 It was also exciting for us to be performing at the Harris Theater in Chicago for the first time. This next season, The Chamber Music Society of Lincoln Center is thrilled to be beginning a three year partnership with the Harris Theater. This is fabulous opportunity for CMS to contribute to the rich musical landscape of Chicago. The first year of this partnership will see three performance throughout the course of the season. Wu Han, David Shifrin, and myself will open the series on January 27th, 2012 with a program of clarinet trios. 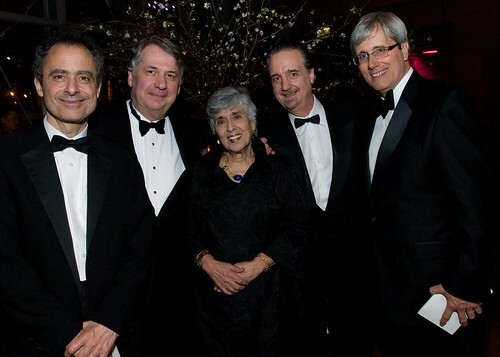 Pianists Jean-Efflam Bavouzet, Anne-Marie McDermott, André-Michel Schub, and Wu Han will present a spectacular program of works for piano four-hands on March 20, 2012. The series will conclude on May 22, 2012 with a program of romantic French chamber works featuring pianists Inon Barnatan and Juho Pohjonen; violinists Jessica Lee, Kristin Lee, and Elmar Oliveira; violist Beth Guterman; and cellist Andreas Brantelid. We look forward to this partnership and returning to Chicago very soon! This past week, Music@Menlo concluded its annual Winter Residency at Menlo School – a celebration of Music@Menlo’s rich educational vision. Alumni of the Chamber Music Institute and festival artistic administrator, Patrick Castillo, prepared a series of enriching programs for students at Menlo School. This past week, we had the wonderful opportunity of traveling to California for Music@Menlo’s annual Winter Residency at Menlo School. The Winter Residency provides an opportunity to bring the best of our educational resources into the classroom, giving Menlo School students the chance to absorb the rich chamber music repertoire through close interaction with world- class artists. It’s also an incredible opportunity for our Chamber Music Institute alumni to enhance their teaching skills and share their passion for chamber music with a new generation of listeners. Music@Menlo is proud to be a program of Menlo School, whose uncompromising commitment to education and dedication to the arts have created an ideal setting for Music@Menlo since the festival’s inception in 2003. Through benefit concerts and educational performances at Menlo School, the Winter Residency is truly a celebration of Music@Menlo’s educational vision. The Winter Residency brought back several outstanding alumni from the Chamber Music Institute’s International Program to take part in the week’s activities. Sean Lee, violin; Michelle Ross, violin; Areta Zhulla, violin; Eric Han, cello; and Chamber Music Institute director and pianist, Gloria Chien; all performed brilliantly in the array of concerts and events throughout the week. One of the highlights for us was witnessing several in-class performances at Menlo School by the musicians and Music@Menlo’s Artistic Administrator, Patrick Castillo. These presentations were brilliantly prepared and executed by Patrick, and took great chamber music into several classes contextualizing the music within the framework of what each course was studying. For example, one of the classes was entitled World Religions—in this particular presentation, Patrick and the musicians focused on Olivier Messiaen’s Quartet for the End of Time. Written in a response to the awful atrocities of World War II, Messiaen’s own faith and deeply felt Catholicism greatly influenced this piece and how he viewed the incredible scenes around him. It was amazing to witness the engagement and interest among Menlo School students throughout these presentations. I want to thank the amazing musicians who performed so professionally and nurtured countless students through these in-class presentations. They are certainly equipped and poised to take our art form into the world and create new communities of appreciation. We would also like to thank Menlo School for being such a spectacular home for Music@Menlo, and we thank the school’s exceptional faculty for their participation in this amazing program.